Costa Crociere is the name of an old Italian ship owner, whose origins go back to the XIX century. After the Second World War, Costa entered into the South American emigrant traffic, transporting thousands of emigrants to those countries. 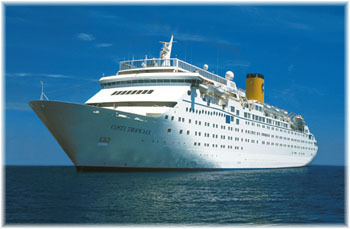 In the late fifties, Costa began her first cruises; the earliest ships traded only in the American market, in association with some US based tour operators, but later Costa also offered cruises in Europe. In the early seventies, Costa Crociere was one of the first owners to foresee the cruise industry growth, and changed the management emphasis from the passenger line traffic, to pleasure cruising. But in the mid nineties, this Italian ship owner was not able to keep up with the investment rhythm that the growing cruise market was demanding. As a consequence, in January 1997 Costa was sold to a 50/50 joint venture between Carnival Corp. and the British tour operator Airtours Ltd., a Company in which Carnival owned at that time almost a third of the shares, and thus became a branch of Carnival Corporation. Carnival Corporation is the largest cruise ship owner, until the RCCL-P&O merger is concluded, and control almost a third of the global cruise market throughout six prestigious branches, such as Cunard and Holland America Line. In the year 2000, two million seven hundred thousand people cruised on a Carnival ship, with a turnover of almost three billion dollars. One of the strategic targets of Carnival is the European market, and the spearhead in the old continent is Costa Crociere. During the autumn of 2000, Carnival Corporation bought the 50% of Costa that formerly was owned by Airtours, thus full control passed to the American ship owner. But Carnival has always powered the owners that purchased and almost immediately after buying Costa, they ordered three new ships from European shipyards, and also transferred two of its own cruise ships to Costa from other branches of the Carnival' stable. Now, Costa Crociere is leading Europe in the number of passengers transported, and is placed fifth world wide, with over 450,000 passengers in the year 2001. In Europe, Costa has a market share of 24%, though in some countries, such as Italy, this figure is as high as 79%. Costa currently owns the biggest fleet in the European market, with eight modern units, including the highly praised Costa Atlantica, delivered in 2000. The total capacity of the Costa fleet is around 10,200 beds. In the summer of 2001, Costa Crociere incorporated the Costa Tropicale, and this year the fleet of the Genoa based owner will receive the Costa Europa (ex Westerdam). Between 2003 and 2004, Costa Crociere will receive, from Finnish and Italian shipyards, another three large cruise ships, between them the two first post-panamax vessels destined for the European market, of 105,000 GT and capable of transporting 2,750 passengers each. These three ships make a total investment of around 1,200 million Euro. All these incorporations mean that in the year 2004, the Costa Crociere's capacity will be around 20,000 beds, which doubles the present available capacity and will permit Costa Crociere to increase her hegemony in the European market. The Costa Tropicale was delivered in December 1981 from the Danish shipyard Aalborg Vaerft as Tropicale, the first cruise ship built by Carnival Cruise Lines. Joe Farcus were commissioned to handle the design and the layout of the passenger accommodation. The first true "Fun Ship" was born. In January 1982, she sailed for the first time from Miami to the Caribbean, but on September 17th she made her maiden cruise from Los Angeles, under charter to Westours, an Alaska based tour operator. The next year, the Tropicale sailed from Vancouver to Alaska on seven day cruises. The entrance in service of new and big cruise ships in the Carnival Cruise Lines fleet suggested that Tropicale would be converted as the test ship of new routes and markets for the American owner. Thus, in 1990 she was the first Carnival ship to be based in San Juan. In 1994, she was also the first Carnival cruise ship to sail from New Orleans, while a year later she undertook the first Carnival cruise to Alaska. In September 1996, Carnival signed an alliance with the Korean Chaebol Hyunday, in order to offer cruises in Asia. In February 1997, this initiative was christened Carnival Cruises Asia, and it was announced that the Tropicale would be destined to that joint venture. But in August 1997, the enterprise was dissolved due to disagreements between the two partners over the Asian market developments. After this incident, Carnival utilised the Tropicale to open a new market. She ran test cruises from Tampa, and began in April 1998 to operate from that Florida port. On September 27th 2000, Carnival announced that the Tropicale, after the demise of Cape Canaveral Cruises, would open a 2 and 3-day cruise market from Cape Canaveral, after the Tampa 2000 summer season and a series of Panama Canal cruises from Fort Lauderdale. But on December 7th 2000, Carnival Corporation announced the transfer of the Tropicale to Costa Armatori, as well as the annulment of the entire Cape Canaveral based cruise program. The internal lay out of the Tropicale was very interesting, because it reflected the transition from the old style passenger ship, to the modern cruise ship. The Tropicale had horizontal segregation, with cabins on lower decks and public spaces above. In reality, the promenade deck was exclusively dedicated to public rooms, between them the casino, the show theatre and the discotheque. The lifeboat davits are situated in the upper part of the superstructure, above the shelter promenade deck; this constitutes a classical element of the old passenger ships, and which is supposed to be one of the main attractive features of the ship. Between the novel design aspects of the Tropicale, can be highlighted the surprising number of outdoor decks, and the first class cabins with balconies, in a cruise ship destined for the mass market. The distinctive wing funnel, clearly influenced by the France, later became a trademark and is a sign of identity for Carnival Cruise Lines. The Tropicale has been designed to attract North American passengers. To adapt her to the taste of the new European clientele, Costa Crociere immediately began to design the refit. After her last cruise for Carnival Cruise Lines on February 10th 2001, the Tropicale was delivered to Costa Armatori, and after a transatlantic crossing, the big refit in Genoa began. Costa's own technical department carried out the refit, and her main contractor was the Genoa based shipyard T. Mariotti, a true specialist in this type of operations. Costa Crociere had already entrusted this shipyard with the reform of the Costa Marina and of the Costa Allegra, both constructed in the early nineties. Why doesn't Costa change the sloped radar mast for a straight one, which would fit better with her new stack? There are few vertical lines or right angles on her former profile, and so the straight funnel doesn't fit well. All the propulsion systems (main motors, shaft lines, propellers, etc.) have been revised and modernised. Furthermore, an additional aft thruster has been installed in order to reduce the use of tugs when docking, and the freshwater generation capacity has been increased. A new grey water system was installed, as well as a new sanitary vacuum system. Moreover, the Costa Tropicale refit has enabled her to fulfil the requirements of her new classification society RINA (Registro Italiano Navale). On the cosmetic side, a new cylindrical stack has been fitted, and all cabins have been prepared for the European market, with a completely new fittings, new furniture, carpets and toilets. The public rooms also have been considerably reformed: an Internet Coffee Lounge and an alternative restaurant, the Bahia Club, have been installed, the buffet has been completely refurbished, as well as the Casablanca Bar, etc. 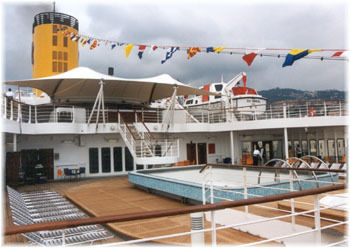 The Costa Tropicale has kept the layout of the old Tropicale, and has eleven decks, seven of them dedicated to passenger use. 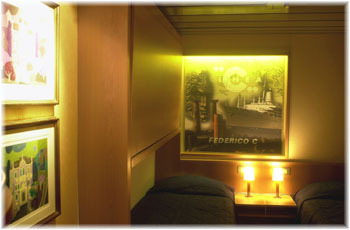 Following the path begun by the Costa Atlantica, the Costa Tropicale is the second Costa ship decorated following a theme that, in this case, shows the tropical places: Caribbean, South America, etc. The lower deck, deck 4, houses the restaurant Corallo. Capable of seating 658 people, there are no windows in this room. Is lower than the rest of the deck, and there are some descending steps just inside the glass entrance doors in order to obtain sufficient headroom over the area. The room is well lit and carpeted to help reduce noise levels. The majority of the tables seat eight people, though tables for two also exist. The main galley is located aft, while the forward part of this deck is dedicated to cabins. It lacks the brilliance of the dining rooms of the contemporary cruise ships, located on the superstructure, with generous use of windows and lots of light. Deck 5, Rubino, has in the central part a small circular atrium which houses in her lower deck two counters, one for information and the other for shore excursions. This two deck circular atrium is small by today's standards, but is intimate and works well because the passengers embark here. It has a precious marble fountain statue crowned with a fibre optics lamp installed in the last refit. The commercial gallery, The Mall, is situated in the upper deck of the atrium, Perla deck, deck 6, and all the commercial areas of the Costa Tropicale are here. These two decks, 5 and 6, house the major part of the Costa Tropicale's cabins. Deck 7, Ambra, houses forward the Tropicana Cabaret, the tiered main showroom, with a capacity of 600 seats. The main problem is the low ceiling and, as a consequence, the next Carnival cruise ship, the Holiday, has a show room which is two decks high, a standard today. The stage is situated forward, and the tables are arranged in three terraces. This guarantees a perfect view, apart from a few seats with poor visibility. The sofas are comfortable enough, but I think the sofas' backs are a little low for prolonged comfort. There is a little bar aft, which also serves as a meeting point for those on board. This room is decorated in vibrant colours, mainly in green and red tones, but also has yellow tapestries, in keeping with the name. Aft this deck, in the tiered superstructure, we find the children's paddling pool - one of the three on board, and the children's room. Costa is trying to increase its share of the family cruise market in Europe, children under 18 years old travelling in the same cabin as their parents travel free, and the Costa Tropicale has magnificent installations for children. Deck 8, Smeraldo, is dedicated exclusively to salons and public rooms. As in the old passenger ships, the public rooms are situated in the center of the ship, with two large shelter promenades both sides, where to talk, to read and to enjoy the sea views. This classic disposition, unobtrusive, implies a certain waste of space. To solve this problem, Costa has installed in those large promenades the photo gallery, the Internet Cafe', the cigar counter, etc, and this has been done to the detriment of the original enchantment of the vessel..
Aft, the promenade deck is open where people can enjoy beatiful sea views and romantic moments after a drink or a show. In the forward extremity of this deck is the Miami Ball Room, decorated in blue tones. It has a capacity for 366 people and a circular layout around the dance floor. A raised floor and a sunken bar, of elliptical design, at the forward end extends around the saloon's perimeter. Just below the forward bulkhead, under eight great panoramic windows, is situated the library. The library tables and chairs, and bookshelves are also in a sunken position. This permits a double use, day and night, of this area. 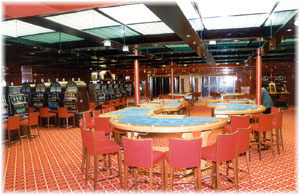 Aft is the Habana Casino with a capacity for 196, maybe slightly big for a European ship. It is decorated in red vibrant tones, but isn't as lavish as the casinos of the newer ships. The neighbouring Casablanca Great Bar is another product of the last refit. It has one hundred seats, and is fitted with a little stage, with live music, and is one of the reference points for the nightlife on board. The mosaic bar counter, the broken mirror behind the counter, the upholstery and the tropical plants fit perfectly the Moroccan atmosphere of the legendary film. Right aft is Duke bar, dedicated to the genial American pianist. It is an intimate palce with only 50 seats, decorated in the style of piano keys. As a matter of fact these are in the tables, in the ceiling, in the walls). The Duke bar has a grand piano in the centre, surrounded by a circular table and sofas for the people that might want to enjoy the most relaxing music on board. In her last refit, the Extra Z Dance Club was converted to a third restaurant, Bahia Club, located in the aft end of this deck. It is a blue decorated location with 150 seats, and has a double use. During the day, the bar and the dance floor are a pleasant meeting point. At dinnertime, this area doubles as the alternative restaurant on board, with reserved tables only. It is served by the best Brazilian chefs, and later, the passengers could enjoy the best Brazilian live music. The vibrant decoration recreates the Brazilian city of Bahia, with multicoloured mosaics, palm trees, two cascades of water, etc. The aft outdoor section has a splendid pool. In her last refit, two Jacuzzies have been added aft, on a raised deck, which permits one to see spectacular sea views. Deck 9, Giada, is located forward of the wheelhouse and the officers' cabins. In the centre of the ship, and just forward of the funnel, is the central pool, with a large open patio completely decked in teak surrounding it, with two bars forward. Aft the pool, under the funnel, is the Giada Great Buffet, the former Boiler Room, with a capacity of 270 seats, 50 are outside, where the passengers can lunch informally without leaving the pool. This "U" shaped buffet is located around the funnel casing and has a wooden floor, and large picture windows, but the views are obstructed by the lifeboats. 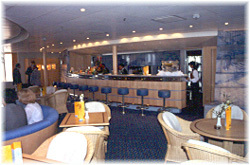 The after part of the buffet constitutes an outside terrace, a consequence of the enlargement toward the stern of this deck made in the refit, with splendid views of the ship's wake, this area is protected from the sun by the aft plastic canvas, a characteristic of the Costa cruise ships. This terrace is a perfect lookout to enjoy the aft decks of the Costa Tropicale, arranged in terraces, and containing the two pools, as aforementioned, on Smeraldo and Ambra decks. The upper deck 10, called Zaffiro, houses forward, on top of the bridge, twelve suites with balconies. Just aft is found the Nautica Spa, smaller in comparison with the facilities of her fleet mates. It has windows that look aft toward the main pool. This complex of health facilities has been completely rebuilt and fitted with a new outfit of jogging machines. Other facilities enclose a sauna and massage rooms, but it lacks a beauty salon, which is located near the Atrium. The jogging circuit is also located on this deck, around the funnel. Aft of the funnel is a large and pleasant open deck where people can sunbathe. On deck 11, Sports deck, there is an open area ideally designed for sun bathing. A Jacuzzi has been added here. All the cabins of the Costa Tropicale have a minimum standard surface area of 14.5 square metres on all decks. They are fitted with two beds, television, drying facilities, excellent storage capacity, bath or shower and safe-deposit box. This compares well with contemporary cruise ships. The cabins are located in the hull along two long corridors on the cabin decks, and so the orientation is very easy. The Costa Tropicale also has 12 deluxe suites fitted with bedroom, salon and balcony, situated on top of the wheelhouse, with marvellous sea views. Last June 23rd the ship was christened Costa Tropicale in Genoa. Her godmother was Madeleine Arison, the wife of Micky Arison, the owner of Carnival Corp. Mrs. Arison had also christened the first Tropicale in 1981. However, the complexity of the refit was such that the first commercial cruise was delayed by two weeks until July 14th, 2001. After that, the Costa Tropicale sailed every Saturday from Venice to discover the Greek Islands on the Aegean Sea, calling in Bari on Sundays, Katakolon on Mondays, Santorini and Mykonos on Tuesdays, Kusadasi on Wednesdays, a full day at sea on Thursdays, and a call in Dubrovnik on Fridays on the return leg to Venice. The ship had an excellent occupancy rate on all the trips during the first European season. This winter, after a transatlantic cruise, the Costa Tropicale is sailing from Brazil, on cruises destined for the South American market. Next summer, the Costa Tropicale will take on the Costa Riviera duties, and will sail year round from the Ligurian port of Savona on seven night western Mediterranean cruises, joining Costa Victoria and Costa Allegra. After the refit, the Costa Tropicale is now one of the most intimate, most European cruise ships of the Costa fleet, recovering the design and decorative criteria effective before the arrival of Joe Farcus designs on the Costa Atlantica. At the same time, she contains all the installations that a passenger hopes to enjoy in a modern cruise ship. 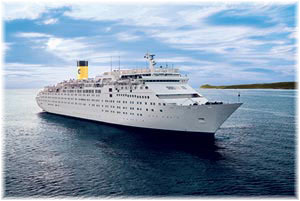 The Costa Tropicale is a ship in which the orientation is easy. Her long promenades and corridors convert her into a friendly ship for first time passengers, with the exception of the main restaurant located at the bottom. The vertical communication, the distance to the nearest elevator being always less than 40 meters, is very intuitive. There is always a staircase rising to the outside and to the inside leisure pursuits! The overall opinion is that Costa Tropicale is a very pretty ship: Costa Cruises did a splendid job during the refit in Genoa last spring, creating on board the vessel a stylish and intimate atmosphere. I hope this pattern will be followed in the future Farcus designed Costa cruise ships.